A couple of weeks ago when we were out in Seattle I got to visit a favourite place to shop - Impress Rubber Stamps. they have lots of cool stamps- row upon row, papers, punches, inks , Memory Box dies. Lots of scrappy goodness. I got to spend an hour in here while they took the grandkids to the park to play. And this is what I ended up getting. A Memory Box Window die, some Washi tape(my first) and some Memento Ink, so I could do a little colouring with my markers. I do love the Memory Box dies! Here's my little project I have been working on-a little 8x8 mini album for Toots from our trip to Yellowstone last summer. Here is the first page. I have been keeping myself busy this morning. Curtis was up and on the road early, down to Helena. I got out and mowed the lawn. It was much nicer than last week in the rain and cold. Have the laundry going too. Got Toots signed up for swimming lessons. This is something she wants to do. And they called to say they would be coming by tomorrow to start with the siding on the house. Hope they don't mess my flower beds up too much. The challenge is simple: use "masculine" colors or embellishments on a girl page, or use "feminine" colors and accents on a boy page. So I chose the masculine colours on a girl page. Paper used: All from MME-Miss Caroline-Dolled Up "Day" Worn Bohemia-Bungalow-You are My Sunshine So Sophie- "Birds of a Feather" Reliable Stella and Rose-Hazel"Special" Dotty Damask -Mabel"So Sweet" Herringbone Follow your Heart"Be Amazing" Blue Doily MME decorative brads Authentique Petite Type Squares Title cut with Quickutz alphabet Primitive Star cut on Cricut with MME papers On to my day. I waited until it warmed up a little for my walk. Even though we have had rain and snow I needed to water some plants that are under the overhang. Brought the plants in the garage back outside. I cleaned up my house. Vacuumed through, mopped floors and cleaned the bathrooms. Was also on call for work this afternoon, but have managed to stay at home. While we were out in Seattle we took the grandkids swimming. It has been a couple of years since Nic was in a big pool. They were both really excited to get in the pool. Kirsten had bought some arm floaties and tubes for the kids. They would wear them in the hotel room. Then we got in the water. Nic was hanging on to his mommy so tight, I think he almost strangled her. But before we left he was getting used to being on his own. We need to get Harlee In swimming lessons, hopefully this summer. Our long weekend is almost over . The weather has been despicable - the sun finally showed it 's face this evening. The lows have been in the 30's and my plants are still hanging out in the garage. Hopefully I will get them back outside tomorrow. Curtis and I went to the movies this afternoon to see "The Avengers"
Changed sheets, washes sheets and towels, did some sewing on blankets for work. On to another week. It is almost noon now and it is still snowing and we are under a winter storm watch until 10pm tonight. See it is coming down pretty hard. And it isn't very warm out either. My plants in pots went in the garage Thursday night and are just hanging out. Hopefully the others I planted will survive. Yesterday I managed to work most of the day and I went in for a few hours this morning and came home on call. So have managed to squeak out a few hours at work and won't have such a measly pay check. My passport was due to be renewed in September. I was really anxious to start this project again, as last time the process took 9 months. They kept rejecting my photos-it took 3 attempts before they finally accepted one. And that was very costly to have to keep resending it. This time I did things different. Curtis and I took a quick run to Lethbridge, Alberta and visited the CAA. I figured they should have it down pat. About 5 weeks ago I sent off the paper work registered mail and it arrived back earlier this week. I feel like I am held hostage while it is out of my hands. It means there is no traveling out of the states until it returns. But now it is my hot little hands. Have kind of neglected my blog the last couple of days. Trying to get the outside work caught up since they are predicting rain ad snow,at the higher elevations, for the next couple of days. And it is cold out-our furnace has been coming on today. My plant in pots are in the garage. I have been quilting some blankets for the babies in the NICU. Have been taking call for work. And I get to work the next two days. Kirsten has a derby match tomorrow and She asked me to sew a banner for them, which I did. Anyway, I will l leave you with a layout I recently completed. I've been working on a 8x8 album for Harlee from our trip last summer to Yellowstone. When not much gets accomplished. I had to have my yearly check up today, followed up with my mammogram this afternoon. I did manage to get the bathrooms cleaned somewhere in the midst of running around. And so we start another week. I am going to get showered and head to Home Depot for some dirt. It is time to get my gardens planted . I actually have some coming back up that I planted last year. Miracles of miracles, I actually got to go into work for a few hours yesterday afternoon. A few changes since I was last there. Haven't really worked since we came back from Hawaii. A couple of layouts to share of Lugnut that I recently have created. I took these photos a couple of weeks ago when we had the grandkids over. Toots discovered her reflection in the sliding glass door. Pretty chilled out Saturday. I didn't sleep well. Was awake at 1230, up from 1:30 - 2:30 and still awake until 4:30. So I was glad when work didn't call for me and I was just on call. But I did get all the ironing caught up and watched a movie while doing it. Quick trip to the grocery store and Curtis and I visited Kirsten at Wheat Montana for some lunch. Since we got back from The coast Harlee has been asking to go to the park and feed the ducks. So, yesterday I picked her up from the bus and we headed to the park and the duck pond. It seems to have a lot of Canadian geese that are quite bold. And they are almost as big as she is. She wasn't afraid, but I was for her, so I put her up on a bench so she would be a little further away from them. And, of coarse, we had to stop at the playground, too. This morning I headed out to Target after my walk to pick up some items for Kirsten, as she had Nic sick at home. And I got my floors all mopped and the vacuuming done. They sprayed my lawn, so it was watered too. And it is raining this evening so that will help the grass too. It has been pretty hot the last couple of days. I even had the A/C on yesterday. Sunday was busy with Caitlin, who was officially graduating from University of Puget Sound. New, she has been done with classes since December. She wanted to walk with her class and friends. She and her friends had a brunch on Sunday morning. I went back with her to her house to help cut up fruit we had bought. These are the girls who provided brunch for their families rather than pay $18.95 for the brunch provided by the college. Curtis and I headed over to the stadium to get seats and Kirsten headed back to the hotel with the kids. The lucky graduates got to sit on the field for a couple of hours. The weather was gorgeous, but rather hot down there on the field. There were over 600 undergraduates and over 100 post graduates. And then trying to find her on the campus afterwards with all those people was a nightmare. And to think this is a small college. We are so proud Cait. You worked very hard getting all your work done in 3 1/2years. Can hardly wait to see what your next adventure will be! I hope all the Mother's had a wonderful Mother's Day. Being a mother is the hardest job in the world and the most rewarding. It has been a whirlwind weekend for us. But I was able to spend it with. Both my girls and my grandkids. A big congratulations to Cait on her graduation. Today I picked up our mail that the post office was holding, went to Walmart for groceries and I just finished vacuuming out the car and wiping it down. After all, Nic was in the far back in his own little space. Need to pick up Harlee from the bus pretty soon. Her are a couple of cards that I made for Mother's Day. Yesterday was spent in Seattle. We started our day with breakfast at IHOP. Then it was off to the Seattle Aquarium with the kids. Kirsten visited a local skate shop. Lunch at Ivars for Seafood. Curtis had a stroll around Frys electronics while Nic napped. Nana visited a favourite Stamp store while they found a park for the little ones. We came back to the motel for some quiet time and had dinner at the Rain Forest Cafe. Harlee really enjoyed it, but it was a little much for Nic. Cait. Headed back to Tacoma for her class graduation party. We are off and traveling to the coast again. Kirsten and the kids are with us. We are celebrating Caitlin's college graduation. It'a handy having a big rig traveling with this crew. Nic rides in the way back. Last evening we went as far as Missoula. There was a huge herd of elk about an hour out of Missoula. We were up and all ready to go within an hour and on the road shortly before 8:30. It's a long day on the road, especially for two little ones. I have been wanting to get new glasses for a while now. At the end of last year we found out our insurance no longer offered a discount for eyewear. So when it was open season for health benefit, I told Curtis we better find something to help defray the cost of glasses since we all wear them. Also dental, since I changed my status at work and no longer qualified for their dental. Long story, I know. So, then I waited patiently until the new year. I went to our usual place and the first time it was closed and the next time the parking lot was so full I couldn't find a park. I thought the third time is a charm!!!! Not! They didn't accept the insurance we now have. It just can't be easy. I just wanted a new pair of glasses. After we got back from Hawaii, Curtis and I were out for lunch. Across the street was an eye glass shop. I dragged Curtis in after lunch, and lo and behold, they took our insurance. Since I need to wear my glasses all the time, I wanted something stylish and fun. This is what I picked out. They are purple and green. Today has been such a beautiful spring day out . Warming temperature and NO wind. I worked outside for a couple of hours- pulling weeds and dandelions out of the garden boxes. Pulling over grown plants. Raking the last of the leaves. I am bushed. I am now sore. I was canceled from work and did this instead. I ironed this morning and got all shirts ironed up for Curtis. I watched the Descendants while I did this, which brought back pleasant memories of Hawaii. Supposed to work again tomorrow and we shall see if that happens. Will at least be on call. They are up to 9 babies. Hunting for bugs and worms. Nic hates spiders. But he doesn't mind the worms. This was yesterday when Curtis and I watched the kids. Don't mind the weeds in the raised beds, they haven't been weeded yet. My helper is in Tacoma. 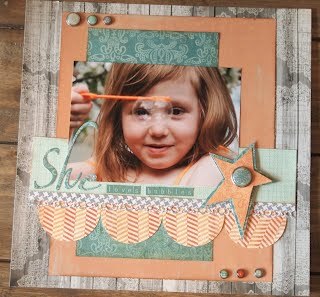 And I spent the day in my craft room scrapping away, since I missed scrapping on National Scrapbook Day! Nice out today, but still kind of cool and that old wind was blowing making it feel cooler. Had an early dinner and Curtis and I are watching The Green Hornet.